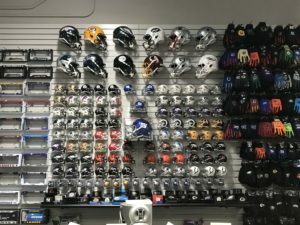 For the second week in a row, Pro Image Sports stores are opening on adjacent coasts. We are excited to announce two new Grand Openings at the Galleria at Crystal Run in Middletown, New York and at the Pismo Beach Premium Outlets in Pismo Beach, California. These store openings come on the heels of recent store openings in northern California, North Carolina and Colorado. After a scheduled store in — opens next week it will cap a 3-week period of 6 new Pro Image Sports openings covering each time zone. The new store at the Pismo Beach Premium Outlets is the 5th Pro Image Sports to open in a Premium Outlets property. Pismo Beach is a popular vacation destination in Northern California, and the Premium Outlets provides the ideal shopping experience for those visiting town. The store is something owner Chuck Stanley has been working towards for a number of years. After a distinguished career in printing he wanted to find a business he had passion for. 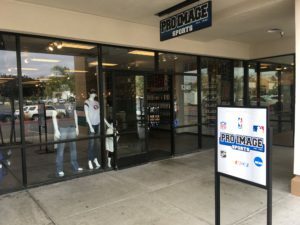 After looking into various franchises, Stanley finally found Pro Image Sports earlier this year and he didn’t hesitate, jumping on the opportunity to open create a footprint for our franchise in Pismo Beach. READY FOR BUSINESS: Chuck Stanley (right) is ready to ring the register during his recent grand opening. “It’s a new chapter in the life of Chuck Stanley. I’m feeling very optimistic,” said Stanley -channeling his inner Rickey Henderson. Pismo Beach locals and tourists alike are going to be blown away by the size and scope of Chuck Stanley’s Pro Image Sports store. Chuck will be in the store to greet customers and do what he does best, talk sports. 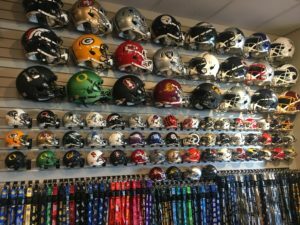 Replica full-size and mini helmets in Pismo Beach Premium Outlets. 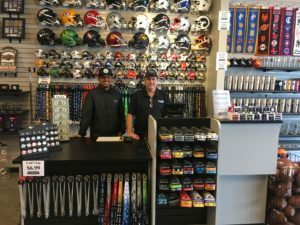 Roughly 2,914 miles away in Middletown -a city tucked away in central New York state- Mohammad Shariff has been going through the same new store set-up at the same time as Chuck with a team from the Pro Image Sports corporate office. Shariff is a longtime software engineer with AT&T that has had a gift shop at the Galleria at Crystal Run for 10 years. 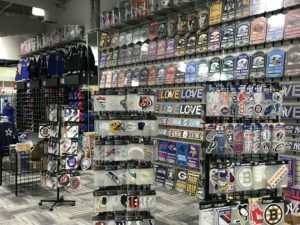 He recognized the increasing customer demand for team licensed sports product and set about finding a way to offer more than the novelty items he carried in his gift shop. Shariff knew he had found the perfect franchise when he came across Pro Image Sports at the 2016 Sports Licensed & Tailgate Show in Las Vegas. 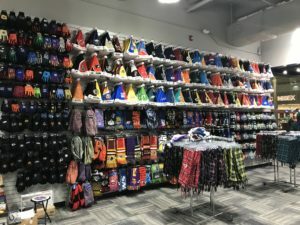 Prior to joining Pro Image Sports, Shariff had a sports novelty gift shop in the mall for the past 10 years. “I met some of the owners (in Las Vegas), learned more about what (Pro Image Sports) offered and knew this is what I’ve been waiting for,” said Shariff. Shariff has had great success selling team licensed Santa hats and has enough to outfit the entire North Pole this Christmas. 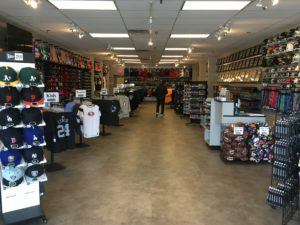 He needed more square footage than the space he was occupying so he worked with the leasing team at Pro Image Sports to find and negotiate a deal for a beautiful new Pro Image Sports store. Shariff’s display of decals and signs is impressive. “Seeing our accelerated growth in a wide array of locations is exciting to see. We are happy for Chuck & Shariff and the rest of our new owners,” said Pro Image Sports CEO Ryan Laws.